Christoph Amberger worked throughout his career in Augsburg where he was the most important artist during the first half of the 16th century. Highly successful as a portraitist, Amberger also executed religious paintings, including the replacement of an altarpiece by Hans Holbein the Elder in Augsburg cathedral that had been destroyed during the religious riots. Almost nothing is known of Amberger’s early years, including where he was born, where he trained and the nature of his early work. However, recent research suggests that he may have trained in Augsburg with the painter Leonhard Beck, whose daughter he married. An important element in Amberger’s art is the evident Italian influence, which he would have assimilated during the two or three years that he spent in northern Italy between 1525 and 1527/1528. In 1530 the artist was again in Augsburg where he began to work as an independent master. 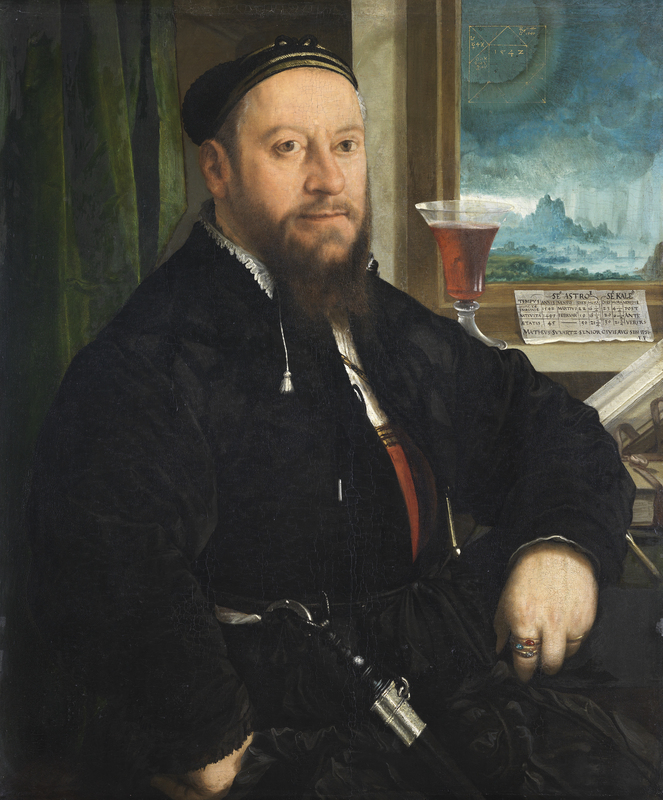 Among his clients were the Emperor Charles V, whose portrait he painted, as well as leading Augsburg families such as the Fugger, and members of the middle classes and patrician families. Together with its pair depicting the sitter’s wife Barbara Schwarz, this portrait was in the collection of the painter Ferdinand August Hartmann in Dresden. The pair was subsequently split up and this panel entered the Von Ritzenberg collection. The two were reunited in the collection of Freiherr von Friesen in Dresden where this panel remained until 1849. It was then owned by Martin Schubart until 1855. In 1906 it was on the London art market and remained in Great Britain in the collection of Leopold Hirsch until 1934 at which point it was with the Haberstock gallery in Berlin. In 1935 it was acquired for the Thyssen-Bornemisza collection. The pair to this panel, also dated 1542, is in the Kisters collection in Kreuzlingen. The sitter, who had been ennobled the previous year by Charles V, chose a pose and setting more redolent of the prosperous middle classes than the aristocracy. His striking form is located in a corner against a curtain with a window on the right opening onto a landscape of mountain peaks in a storm. Schwarz is seated and his bulky form occupies most of the panel, with various books located on the right. Resting on the windowsill is an elegant glass filled with red wine and a sheet of paper with details of the sitter in the form of a calendar with astrological information. This unusual document is completed with a horoscope painted in gold in the window space which repeats the year of the painting’s execution next to the date of 21 August. Matthaüs Schwarz was from a merchant family, travelling as a young man to Italy to learn accounting and the latest innovations in this field. He subsequently wrote various treatises on the subject and was also in the service of the Fugger. This unusual individual was also painted by Hans Maler and there are also portrait medals of him by Friedrich Hagenauer and Jans Kels. Schwarz wrote an interesting book known as the Trachtenbuch illustrated by the miniaturist Narziss Renner with the collaboration of Christoph Amberger’s studio. Of an autobiographical nature, this manuscript has 137 illustrations describing the most important pieces of clothing that Schwarz wore throughout the course of his life, accompanied by annotations. This is an enormously valuable text as it provides a great deal of information on male dress in the German Renaissance. The project was continued by one of his sons, Veit Conrad, who opened his “catalogue of fashion” with miniatures of his parents as they appear in Christoph Amberger’s paintings, but full-length. The miniature of Schwarz is interesting as it reproduces the corner of the room seen in the present work, but with more detail. The present panel is a fine example of Amberger’s portraiture in which the sitters are presented with a discreet degree of idealization in line with Italian art. This approach, combined with the skilled modelling, elegance of the colours, colour combinations and settings all ensured the artist’s success in this genre.